I do not understand Kanye West. I had a friend once who was in love with him, she listened to “College Dropout” in her car so much that it melted in the summer sun one year and she had to buy a replacement… and a replacement for that replacement when she broke it again. She jokingly requested that we play it at her funeral, and at her actual funeral we did question why there was a sincere lack of Kanye, but I thought about that mostly for her and not for Kanye. I find that Kanye West is everything wrong with celebrity culture—he’s gauche and explosive, he has an overblown sense of himself, he makes painfully heavy-handed political statements and calls them art, he frequently puts his foot in his mouth, and tries to come off as smarter than he is. He’s arrogant… and I mean arrogant. He IS the modern Narcissus—we will one day read that Kanye starved to death because he could not stop listening to the sound of his own voice or broke his back because he followed one of his many muses too close to the sun. The saddest part is Kanye believes that he is not only Yeesus but that he is probably a bigger deal than Narcissus or Icarus because they didn’t have the “Kanye” touch. It takes balls to say you’re bigger than Jesus, the Greeks, the entire voting committee of the Grammy’s, America (to think of it, half the countries on the globe), and the laundry list of other people Kanye has put under himself. But, Kanye’s got balls—this I know for sure. Given that I don’t understand Kanye, I was really, really, really hesitant to read Mr. West because the subject matter is Mars and I’m just a lowly rover trying not to crash land. Compound it with a modern poetry compilation—poetry is so out of my comfort zone if you were born after Poe—and I was just very uncertain that I was the best reader. But, then again, some of the best books of my life are books I’ve approached from outside of my comfort zone. I put off writing about Mr. West because I wasn’t sure how to phrase what needed to be said about it; how to articulate where it fit in the wide world of literary genre. After weeks of thinking about it, here’s what I came to: Blake’s representation of Kanye perfectly represents the modern obsession with celebrity, the “friend in my head” mentality that America is coming to be defined by. For better or worse, America is the great zookeeper of the celebrity beast—and I don’t mean to make it sound as though I don’t partake: Kate Middleton is totally my “friend in my head,” I totally believe she and I will one day chat over a soothing latte while we wear sensible heels and a Zara dress that will sell out instantly (we choose blue, it’s the best color on both of us). Of Kanye, Blake writes many things—some beautiful (about his love of his mother, the way he went to her when she died), some troubling (Eve gave the apple to Kanye), some random (Twitter feeds from people and YouTube videos? ), and odd in the same way Kanye’s “cultural” lyrics can be: intentionally random, aiming for some bourgeois comparison, and sometimes pulling it off with great aplomb (and sometimes leaving one scratching their head). The ones that struck me as perfectly about the modern American obsession with celebrity include lines like “Regardless of his face, Kanye is not always treated like a man.” Then how is he treated? Like a god? One assumes given the devotion of his mother, Donda, that Blake mimics in her writing as she carefully, painstakingly goes over how a car accident utterly destroyed Kanye’s face. My impulse is to reject that I need to care about Kanye’s face when he does not care about mine—that this dedication is an odd, exploitative form of selflessness that does not enrich the giver and yet the giver continuously gives. In her poem about the day Kanye created a Twitter account (a sentence I could never imagine myself writing prior to today), Blake perfectly frames our collective obsession. I don’t care about Kanye’s “Suits, videos, jets, pillows, the words you picked up overseas” but I would be lying if I said I didn’t follow Neil Gaiman and George Takei’s Facebook updates for the equally inane details of the their lives (I’m amused by Gaiman’s white German Shepherds in snow… is that amusement less mundane or special than Blake’s?). There are times Blake attempts to elevate Kanye to the Literati’s level by cutting his name and his lyrics into sounds that are like the sounds of other languages, in Italian and Yiddish, speaking of the “Con” sound of Kanye and than the “Ye” which was possibly my favorite poem of the bunch. This poetry collection is very modern; it includes not only Kanye’s Twitter remarks (and how many re-tweets he had), but also shows Twitter reactions to Kanye, gives YouTube links, our media snapshots of modern society. At first this really bothered me but it is another moment in time, a section of our society, frozen for all future generations. 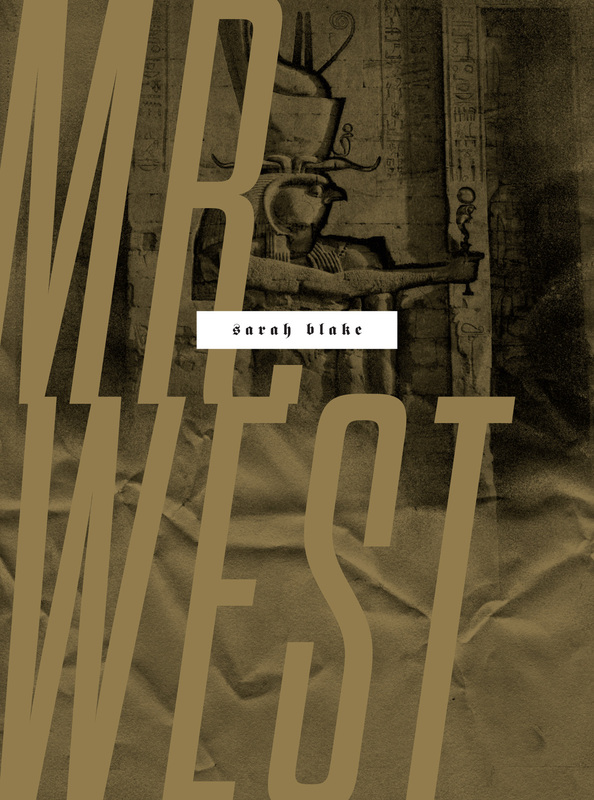 Sarah Blake has both an MFA and MA in creative writing from two universities and currently lives outside Philadelphia with her husband (Noah) and son (both make frequent appearances in Mr. West). 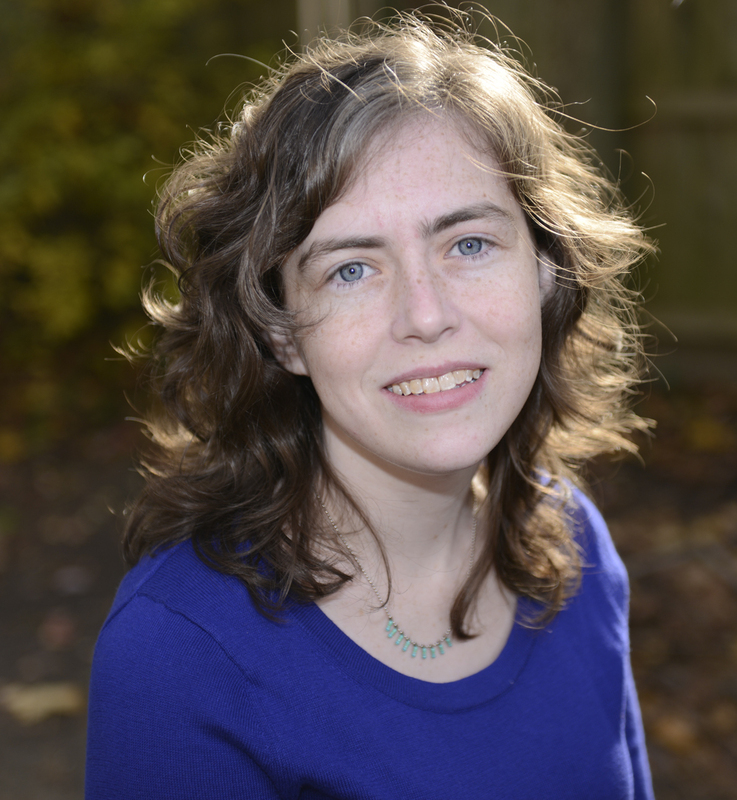 She received the 2013 NEA Fellowship and has been listening, devotedly, to Kanye for about a decade.